Intelligent traffic routing that makes decisions in real time based on RUM metrics or any other custom parameters. 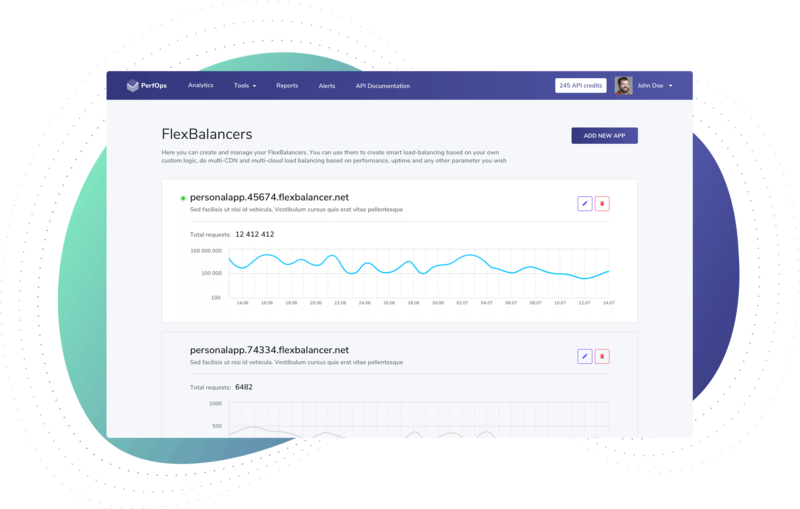 Monitor the uptime of your servers and services and connect them with FlexBalancer for enhanced failover and uptime. Use both RUM and synthetic tests to monitor and understand the performance and availability of CDN and DNS providers. Analyze the performance and availability of your CDN, DNS or FlexBalancer in full detail. Use our RUM platform to monitor your own infrastructure like custom CDN or DNS. Debug and benchmark services using our network of global servers to run commands such as traceroute and curl. We provide Raw Logs for all of our services including RUM benchmarks, DNS tests and FlexBalancer decisions via our UI and API. Create alerts on top of our RUM and Synthetic data to get notified in case of availability or performance degradation. Schedule custom whitelabel PDF reports to share with your operations, sales and marketing teams.